The International Code for Ships Operating in Polar Waters or The Polar Code as it is more familiarly known, is expected to take effect on 1st January 2017. Adopted by the IMO, this risk and goal based system will be mandatory for any sailing planned in the polar region. A specific risk analysis has to be undertaken to assess and mitigate potential risks to demonstrate compliance with the code. In readiness for the introduction of the code, Norsafe has become the first LSA supplier to have executed full scale tests and trials during a joint stakeholder SAR-EX (Search and Rescue) expedition in April 2016 with the following stakeholders: Norwegian Coast Guard, Norwegian Maritime Authorities, Norwegian Petroleum Safety Authorities, ENI, DNV-GL and 5 different universities. 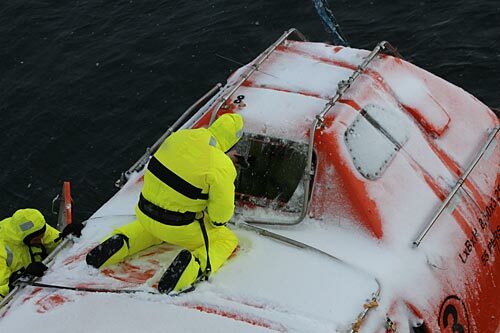 Using a standard Norsafe Miriam 8.5 lifeboat, the expedition simulated a full scale escape, evacuation and rescue operation (to accommodate minimum 5 day survival with the lifeboat as a habitat), in ice infested waters 80° north of the Barents Sea. During the expedition Norsafe conducted tests to address lifecycle issues with LSA equipment which may be exposed to polar conditions. This included a full scale study to determine how to avoid the loss of warmth from a heated lifeboat in conditions of minus 30 degrees Celsius. Full scale test studies were also carried out to test the performance of installed sprinklers when used in icy conditions. The SAREX expedition and Norsafe’s participation gave a unique insight into understanding the risks involved and how best to mitigate them. In fact, it has also led to the company being selected as a supplier of LSA for the British Antarctic Survey Polar Research vessel “Sir David Attenborough” currently under construction at Cammell Laird Shipyard in Birkenhead, UK. Norsafe equipment will be specifically prepared for this Polar operation after extensive discussions with the British Antarctic Survey project. The project sourced items from Norsafe’s broad product spectrum and production locations selecting JYN 100 conventional lifeboats for 90 persons along with Merlin 615 and Magnum 750 fast rescue boats.